Getting kids involved in archery (particularly in bowhunting) is one of my life’s primary goals. As a single dad, I influence and mold my children in countless ways. Since they have no other parental role model, I really have to watch my Ps and Qs. There is no buffer. In front of my offspring I never veer from normative behavior, yet I try to express to them the reality of human frailty. Sometimes I tell my kids, “Believe it or not, I am a flawed human being—just like anyone else.” They stare at me with utter incredulity, but that degree of disbelief in my fallibility will diminish over time. Right now, Dad can do no wrong. At some point they will find chinks in my armor, but for now I am their bowhunting hero. I take that role very seriously. Whether we realize it or not, each of us can be a heroic figure to a youngster. 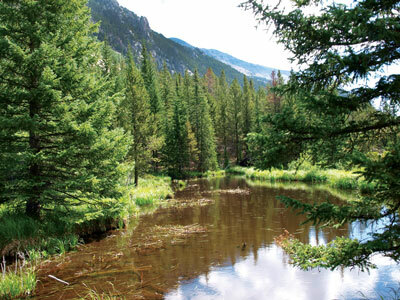 The scenery alone may inspire children to pursue the outdoor lifestyle. Ironically, given my love for the sport, I did not steer my children toward archery. If anything, I initially discouraged them. I knew all too well how an addiction to bowhunting can impact one’s life, and not always in a positive way. My college studies, my performance on certain jobs, and my personal relationships have suffered as a consequence of my obsession. My kids chose for themselves to pursue the bow and arrow. But having been a witness to their resultant self-improvement over time, I now understand the value of introducing children to archery. It certainly gives them a sense of confidence. Regardless of a child’s physical stature or inherent athletic abilities, he or she can become adept at launching arrows. I do my best to make time to mentor children unrelated to me, as well as my own brood. We owe it to up-and-coming generations to pass on the art of woodsmanship and our profound appreciation for the outdoors, whenever we are presented with an opportunity. If you know youths who show signs of being potential bowhunters, by all means get involved. Foster their interest. The future is theirs, and it belongs to them. Several years ago, I took my daughter, Adele, my son, Victor, and a couple of their school friends on an elk hunt in western Colorado. They spent most of their time bird hunting, fishing, camping, and hiking, since they were still not old enough to hunt big game (Colorado does not issue big game tags to anyone under the age of 12), but I would see to it that they learned valuable lessons while absorbing the wonderful atmosphere of elk camp. Taking time off to fish. On this trip, having fun was paramount. It was late September, the height of the rut, and my hope was that the kids would get a chance to hear bulls bugling. 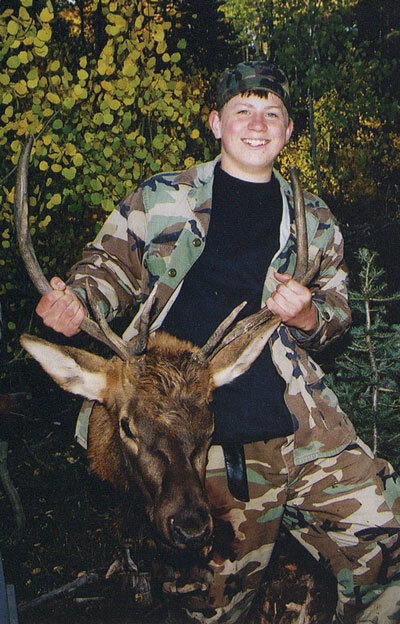 To be honest, my expectations of bagging an elk were low. With only five days left in the archery season, I did not anticipate success. I just thought this would be good exposure for the children. We spent plenty of time goofing off and stump-shooting around camp. After all, this trip was basically about having fun. In the mornings and afternoons, we would saunter through the woods, collecting an occasional grouse and noting possible ambush sites. During the first two days, I barely thought of elk. I was definitely not in the right mindset. I had elk hunted with a buddy earlier in the month, and we had experienced horrendous weather and a crushing series of failures. I left the woods feeling burned out. 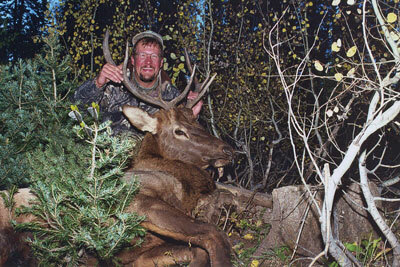 Since then, I had chased mule deer and bear, and I admit that my mind remained focused on those species. At night, I didn’t dream of big bulls. Bucks and boars still haunted my sleep. 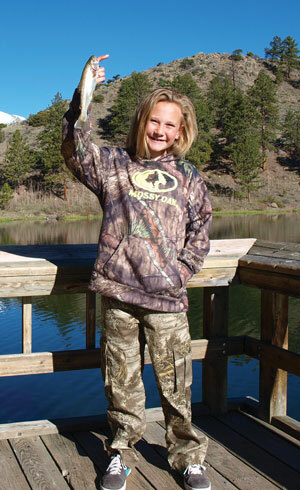 So, to shake things up I took the kids fishing on our third day of elk hunting. The lake was about an hour’s drive from camp. I figured it would be a great field trip for the children and a necessary diversion for me. It turned out to be a smart move. We all had a blast, even though Adele was the only one to catch a fish. After a few hours of angling, we hiked to timberline and had a picnic. The kids were feeling relaxed and decided to open up. Pre-teens can be pretty direct and articulate when they don’t think they’re being judged. I enjoyed their candor. “Not really, honey,” I replied. On the fourth morning, while grouse hunting, the kids and I discovered some elk rubs and decided to construct a brush blind large enough to conceal the five of us nearby. Essentially this was a lesson in blind building, and the kids took to it. Then we returned to camp for a nap. By 4:00 p.m., we were sitting in our hideout. It seemed crowded, and even though we had done an exceptional job, I felt exposed. How could an elk come within recurve range and not notice the five of us? This would never work. Half-heartedly, I began cow calling. Every 15 minutes or so, I would go through a series of mews. Lacking confidence, I nonetheless was quite certain the kids were enjoying themselves while gaining knowledge. They kept chortling softly with anticipation. This bull was the culmination of five partners working to get things done. Four of them just happened to be children, still too young to hunt big game themselves. After a sleepless night for all five of us, we set off early the next morning to locate the bull. Surprisingly, it didn’t take long. We found the elk within minutes, then proceeded to quarter and haul him out. A bear had chewed up a portion of one ham, but we salvaged the rest. Back at camp later, we celebrated. We had worked hard to pack out the bull, and now it was time to play. We broke out a deck of cards. The stakes consisted of Hershey bars and Starbursts. Adele, Victor, Danny, and Nick, regardless of their size and youth, had worked like seasoned mountain men while hauling meat. I owe them a profound debt of gratitude. This was a team effort, not only to pack out an elk, but also to ensure the future of a glorious outdoor pursuit. As bowhunters, we all need to move in that direction. Together, the old with the young, me must carry the torch. You’ve heard it before, I’ve heard it before, and we all know it’s true. The perpetuation of bowhunting depends on the younger generations. But we must become partners. We must all shoulder the responsibility of shepherding our pastime into the future. Danny felt like a hero as he toted the bull’s head out of the woods. When all was said and done and the meat was in the cooler, we got the campfire going. The evening chill was settling in as I started cooking. We dined on elk tenderloin and fingerling potatoes, and the kids gobbled up their portions. Whereas elk meat was nothing new for my children, Danny and Nick had never enjoyed the savory flavor of wapiti. It was quite evident that they loved it. Between mouthfuls, the kids were all smiles as they chattered enthusiastically about their plans to embark on their next elk hunt. The sentiments they expressed were familiar. I was in their shoes a few decades before, but I had not forgotten the emotions. Their words echoed in my mind, rattling around in there briefly like the name of a half-forgotten girlfriend—a name without a face, but a potent memory nonetheless. The author is a freelance writer living with his two children, Victor and Adele, in Simla, CO. His books, Stickbow Trails and Traditional Archery Adventures in The Modern World, are available on Amazon. Equipment Note: On this elk hunt, Jeff carried a 52# Stalker Wolverine recurve, Easton XX75 arrows, and 180-grain Magnus Snuffer broadheads. The post Their Time—Take Kids Bowhunting appeared first on Traditional Bowhunter Magazine.